Yes. On rare occasions I have made food thankyous. Thank you for recommending me for MTPCCR (oh yeah, I need a letter again…), thank you for being seriously special folk in addition to being special co-workers, and thank you Student Services!! My first food thankyou was to Helaine (no foodphoto), who believed in me, connected me, and helped me realize my academic path. I think I owe you an “i’ve finally graduated” food thankyou. Let’s take a trip down memory lane, shall we? Here we have a box of treasures for those who wrote MTPCCR recommendations. 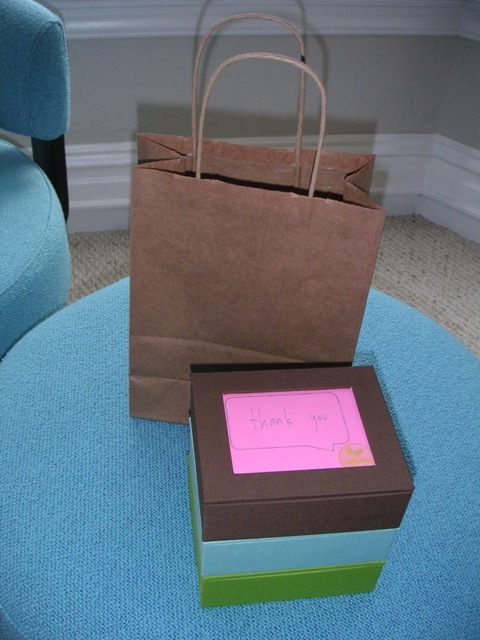 I bought blank cards, and the boxes were lovely, so I put the cookies in them to give away. Inside I tucked two types of cookies, both sandwich. The pink are meringue, dipped in dark chocolate, and sandwiched together. The others are two flourless pistachio cookies – sandwiched and enrobed in dark chocolate. Both were tasty, and recipes were courtesy of a certain martha, in a love or valentines themed february volume. Then, I had the pleasure of attending a wonderful evening of GRADS closure. I wanted to thank my friends/co-workers for helping me through a hard year. This is my modified family recipe for pound cake. No changes except I made them into little cakes (using that same texas sized muffin tin!). It worked. I think I also lowered the baking temp and cooking time. I made a meyer lemon curd, added blueberries, mint leaf, powdered sugar dusting, and a dollop of crème fraîche , and there was no turning back. Three generations of scott/robinson women went into this food thankyou. PS. Never forget the serenade!! And finally, I made my mom’s caramel cake into baby cupcakes and topped them with marzipan shaped fruits and vegetables. In keeping with the theme of public health, I insisted that student services/SPH have their fruits and veggies with their dessert. This was really fun to make – the marzipan art was kind of calming to create. The key for fruits/veggies: beets, carrot, pear, banana pepper, lime, grapes, raspberry, strawberry, + orange. dirt bombs, doughnut muffins, or duffins? I don’t know what you call them, but I call them “breakfast , lunch, or dinner”. A neighborhood bakery (side note: I was wondering as I post, can you call it a bakery if they don’t bake on said premises? Apparently the answer is yes.) sells these really delicious pastry. On Saturdays I go by and pick up a treat with coffee. I thought, I can make this! I found several recipes online, but my favorite looked the most like the muffins from the shop I frequent. I followed the recipe, which is not my forte. I’m a girl who likes to improvise. Lo and behold, they turned out exactly the same. I will freeze the extras and thaw for Saturdays and other special occasions! The recipe yielded loads of dough. I used a “texas” size muffin tin, and filled each cup to the brim. I did have a moment of concern when I saw them rising in the oven. Giantess muffins! As soon as they are cool enough to handle, brush them with melted butter and roll in a mixture of cinnamon and sugar. Mmmm, try for yourself! Or come over for brunch some time. I’ve lived in San Francisco for nearly ten years. In that time, I’ve met mostly people native to other locales. Locales with seasons. I never hear anyone say, “I miss sticky summers and walking into gnat swarms”, or “Black ice takes me back”. Usually it’s, “I miss Fall”. I do, too. So I made a pie. Well not yet this year, but a few back. It was a love pie. The love moved on, but I do have a photo memory of a tasty baked good. I can live with that. The photo reminds me that what I miss of “Fall”, and other seasons, are reminders that life is transient – strung together cycles of fried fresh corn, tomatoes from vines braced with pantyhose, Mom’s caramel cake, Christine’s potatoes and onions, 10 types of apples, pumpkin bread, and all the countless things that tie me to distinctly different years in my life. “That was the year the cake fell, but tasted good anyway”, or “We used sweet potatoes instead of russet”, and so on. My belly is my sundial.